I got a couple of hours last night to spend on my stitched sketch project, I’m still not sure whether it is going to turn out as I planned but it is now at least beginning to look more like one of my sketches. 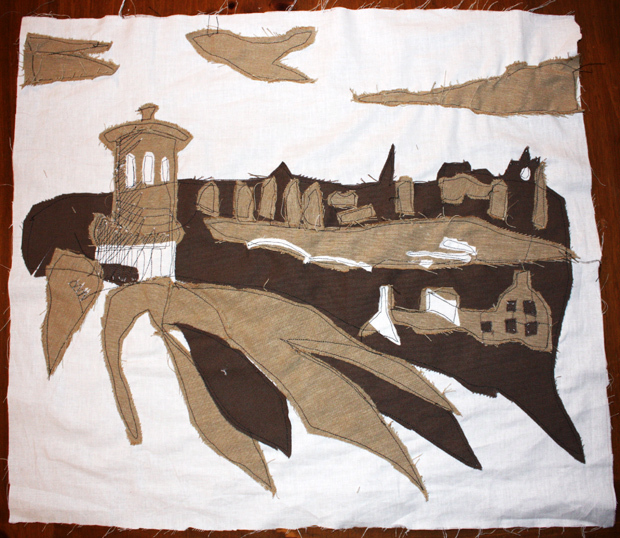 In my previous post Stitched sketch: Day 1 I cut out and stuck down pieces of material to look like a well known Edinburgh view. Tonight I used the sewing machine to roughly sew around all the pieces. I was surprised how well the pritt stick had kept the pieces stuck down. 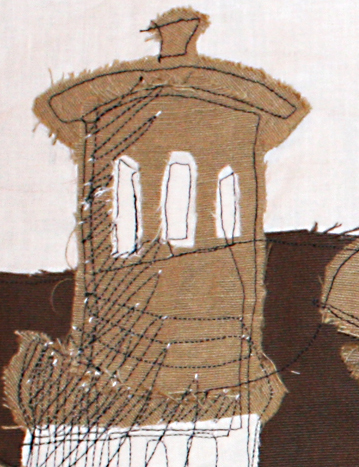 Once all the pieces were securely stitched down I could then start the fun part – trying to shade using the sewing machine. Only I ran out of time so I have only just started this on the monument on the left but you can get an idea of how it will come together using the stitched lines instead of my usual pen strokes. I’ll upload more when I get chance to work on it again.